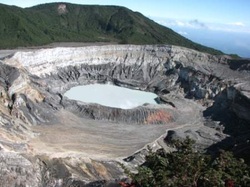 Rincón de la Vieja Volcano National Park, in Spanish Parque Nacional Volcán Rincón de la Vieja,part of theGuanacaste Conservation Area and the Area de Conservación Guanacaste World Heritage Site, is a National Parkin the northwestern part of Costa Rica which encompasses the Rincón de la Vieja and Santa María volcanoes, as well as the dormant Cerro Von Seebach. The last eruption here was by Rincón de la Vieja in 1998. GeographyThe nearest city is Liberia to the south of the park, and there are two facilities at the park for visitors information and guides the Santa Maria and Pailas stations which are both on the southern side of the park.